The following list is approximate and partial, and it changes from time to time. It is based on information from Palestinian traders and businesspersons, international organizations, and the Palestinian Coordination Committee, all of whom “deduce” what is permitted and what is banned based on their experience requesting permission to bring goods into Gaza and the answers they receive from the Israeli authorities (approved or denied). It is not possible to verify this list with the Israeli authorities because they refuse to disclose information regarding the restrictions on transferring goods into Gaza. 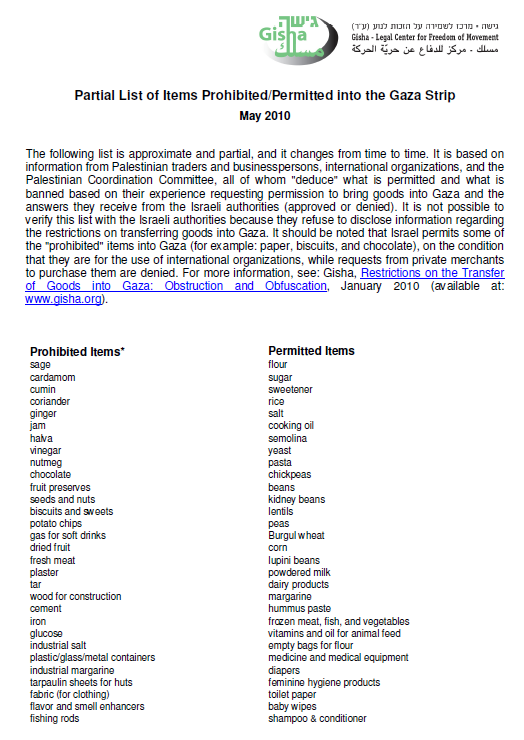 It should be noted that Israel permits some of the “prohibited” items into Gaza (for example: paper, biscuits, and chocolate), on the condition that they are for the use of international organizations, while requests from private merchants to purchase them are denied. For more information, see: Gisha, Restrictions on the Transfer of Goods into Gaza: Obstruction and Obfuscation, January 2010 (available at: www.gisha.org). *Some of these items are permitted if they are for the use of international organizations.